Welcome to our companion planting guide for companion planting with herbs. We cover companion plants, attracting beneficial insects and deterring harmful ones. Companion planting is simply utilizing the growth habits, natural insect attractant or repellent attributes and chemistry of companion plants to help each other grow and thrive. A companion plant might attract honeybees or repel cabbage flies. A companion plant might provide specific nutrients to the soil or even supply shade or structural support for their companion plants. When we started working on Our Herb Garden there were virtually no other websites which discussed companion planting with herbs. Sure, there were numerous resources that covered companion planting in general or companion planting vegetables but ours may have been the first to focus on herbal companion planting. 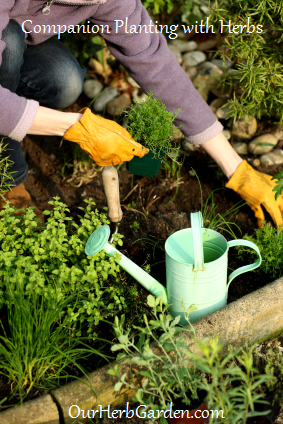 We researched the herbs discussed on Our Herb Garden along with several other popular herbs and using a variety of sources have compiled separate pages of information on companion planting to help you decide how best to layout your herb garden. As is typical when using multiple reference sources, we encountered several companion plants that were listed as both beneficial and harmful to other plants. For those herbs, we listed the information we obtained and provided any further explanations for the disagreement that we could find. Here’s a list of all of the articles on Our Herb Garden where you can learn more about each of the culinary herbs we discuss and about companion planting. Our Herb Garden’s companion planting guide was designed to focus on companion planting with herbs. Obviously, there are many companion planting guides available both online and off. Of all of the ones that I’ve researched in creating our guide, I think this book available on Amazon takes a most ingenious approach to the presentation of information.